Twitter FriendAdder enables you add or remove your twitter friends automatically, get free updates forever. Twitter FriendAdder supports traditional Tabbed mode and our original Tree mode to surf in Internet as a Web browser. You can even browse hundreds of web pages simultaneously in its tree mode. In addition, Lively Browser has patent right for the tree mode browsing method. use this Twitter Friend Adder softare to manage your Twitter friends. 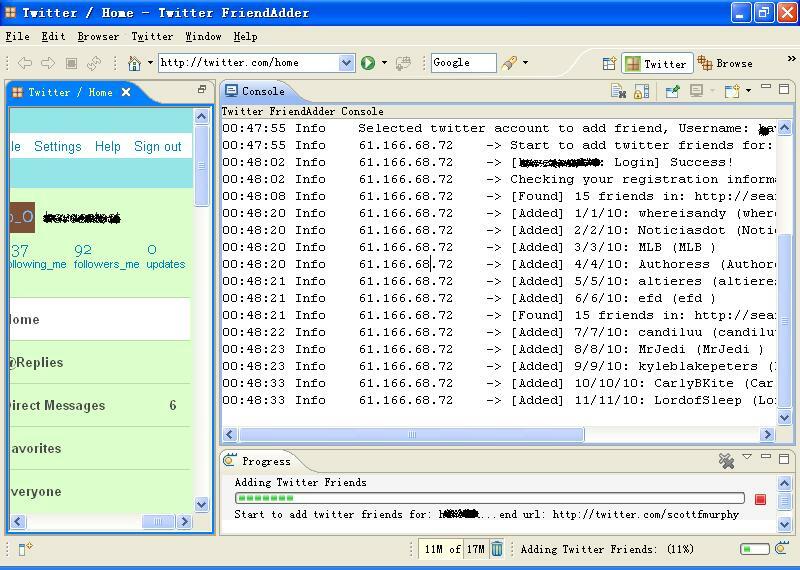 Twitter Friend Adder software to add or remove twitter friends automatically. Qweas is providing links to Twitter FriendAdder 3.3.2 as a courtesy, and makes no representations regarding Twitter FriendAdder or any other applications or any information related thereto. Any questions, complaints or claims regarding this application Twitter FriendAdder 3.3.2 must be directed to the appropriate software vendor. You may click the publisher link of Twitter FriendAdder on the top of this page to get more details about the vendor.